1) Indonesians repatriate from the Netherlands to their native country. Amongst them a former member of the Tweede Kamer (House of Representatives), R. Effendi. 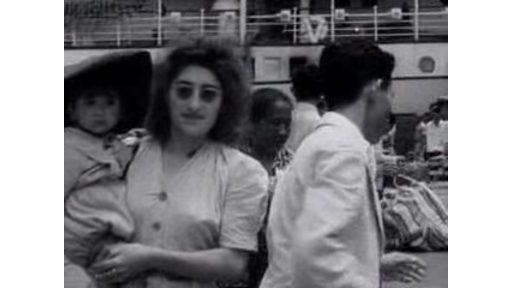 SHOTS: - in Batavia people go ashore with small boats; after their luggage has been checked by a customs officer they get into a steam train (from 00:16 Effendi). 2) from 00:48: the preparation of the local food tahoe (tofu) in the Indonesian countryside. SHOTS: in a manually operated mill two boys grind soybeans; a girl sieves the grains; in a second mill the grained soybeans are mixed with water and grinded a second time; the soybean porridge that has formed is boiled and transferred into a mould which is then wrapped in a piece of fabric; the moulds are put under a press to get the water out; the tahoe is laid to dry in big baskets in the sun and is then ready to be eaten. 3) from 01:30: the expansion of the stock: breeding stock that has been bought in Australia is brought in by ship. Airplanes are used to distribute the cattle across the archipelago. SHOTS: - a ship with cattle is unshipped: a crate containing a cow is loaded off the ship "Tubantia" with a crane and loaded into a lorry; - on deck are cages with pigs, chickens and rabbits; - Indonesian workers load the pigs into crates; - a pig in a crate is shoved into the door of an airplane; - the airplane (Dakota DC-3) takes off on a soggy airfield.